White juice black gamay is getting well in granitic soils. It is not so sturdy. As this variety is very prolific, we cut the vine as short as possible (usually called in "gobelet" way), to curb its growing. As we just explained, the plantation density is high ( 10 000 vines per hectare). It produces soft, smooth, fruity and spicy wines, usually drunk young but also older, after 3 to 5 years. 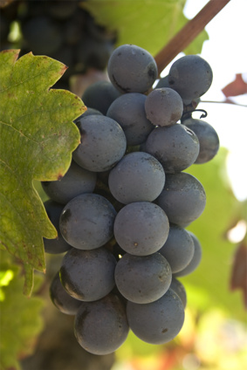 This grape variety shows very typical aromas such as red fruits, spices and cinnamon. Getting older, it turns to Burgundy aromas. The Chardonnay one makes yellow and compact grapes, with a sweet juice. Most famous white Burgundy wines are made from this grape variety. This kind of vine is quite sturdy, productive but very fragile when spring freeze appear. It produces fine wines with high aromatic potential. The most relevant aromas are : fresh white fruits, white flowers, honey, fresh butter, and toasted aromas when gets old. The palate is often ropy but fresh enough to be well balanced.